Albert Girard was born in France in 1595. His family later moved to the Netherlands as religious refugees. Girard attended the Univeristy of Leiden at age 22 where he studied music and his interest of choice was the lute. Indeed, he made his money at this as a musician. His interest in mathematics grew and in 1625, he translated the works of Stevins. In 1626, he published his first book on trigonometry. In this very influential treatise, this terms "sin", "cos", and "tan" as abbreviations. This was the first time that this was done (see here for the history of trigonometry). The book contains the formula for the area of a spherical triangle. Girard made numerous original contributions that had a lasting impact on the history of mathematics. He was the first to propose the fundamental theorem of algebra that an equation to the power of n necessarily had n roots. Girard also came up with important identities relating to symmetric polynomials which Newton independently discovered. He was also the first to express the Fibonacci sequence as the well known recurrence relation: Fn+2 = Fn+1 + Fn. Despite Girard's very innovative ideas, he did not include mathematical proofs of his ideas. 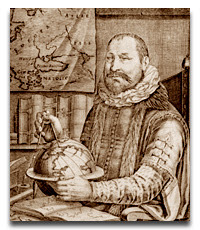 Girard, like many of the mathematicians of his time, was primarily interested in military applications of mathematics. He had a strong interest in the nature of fortifications and engineering. At the time of his death, his occupation was cited as engineer. Girard died on December 8, 1632.